It's almost Valentine's Day so if you're looking for a gift for your partner or even yourself because, treat yo self, then today's post is for you! I was very kindly sent a gorgeous watch from the wonderful people over at Forge & Foster and I think it would make a lovely gift for Valentine's Day (or Mother's Day which is fast approaching, if you live in the UK). 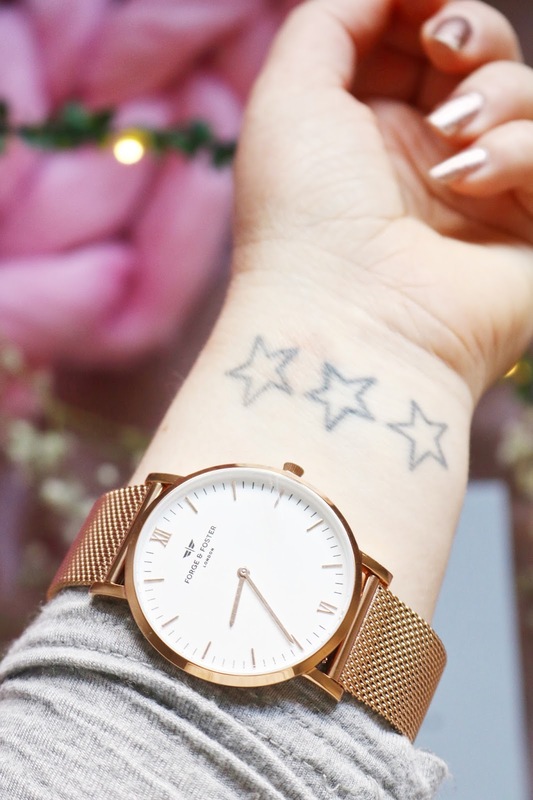 I was able to choose a watch from their selection of gorgeous womens watches (they have a range of mens watches too) and I chose the rose gold watch, obviously. 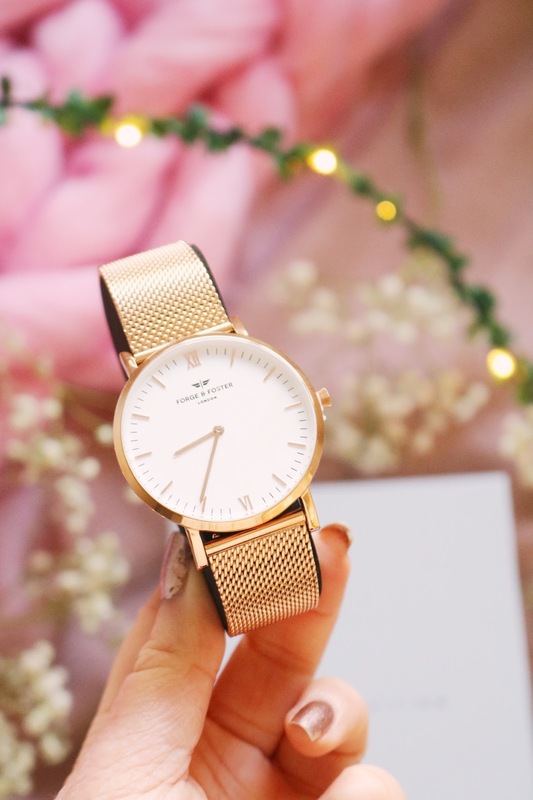 The watch I have features a polished rose gold case and mesh strap but unlike some rose gold watches or jewellery, it isn't an orange or brass toned rose gold, it's a subtle rose gold which I love as it's more wearable. The watch arrived beautifully packaged and presented in a minimal but classic and expensive looking box. It not only comes gorgeously presented, it also comes with a microfibre cloth, adjuster and an instruction/user manual, all kept within an almost hidden compartment within the box. The presentation of the watch is just stunning and I think it would definitely receive 'oooh's' and 'ahhhs' from the gift recipient as it looks much more expensive and luxurious than it's affordable price tag. The watch that I have is the classic edition which is made with high grade materials to create a minimal, elegant and timeless design that would be perfect for casual or formal wear. I love the mesh strap and the large face (40mm), it's quite a simple but eye catching watch to wear. It's unlike the other watches I have because of the larger face and the delicate and unique mesh strap as well as the subtle rose gold tint. 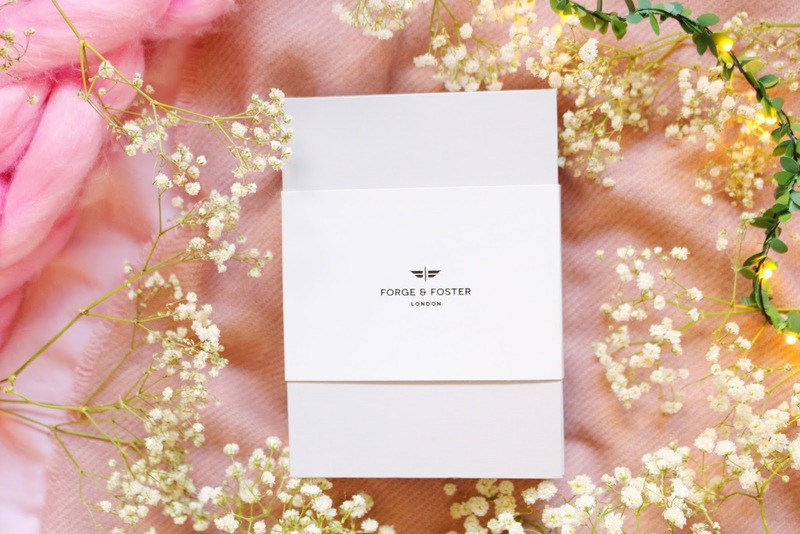 All of the watches from Forge and Foster are handmade which adds such a special quality and uniqueness to them and it also makes for an extra special gift for a loved one this Valentine's Day or Mother's Day. They offer free worldwide delivery on orders over £50 and easy returns as well as a 24 month warranty. What do you think of this watch from Forge and Foster? Aaaah wow it is so beautiful! I love the look of this, I have one really similar! This watch looks gorgeous, such a simple, elegant design. Great value too! Oh my this is gorgeous!! I love everything rose gold!!! I didn't expect to love a gold watch so much! I really love this watch, the colour is gorgeous! !